OAKLAND, Calif. — Murray State’s electric point guard Ja Morant stole the show on the first full day of the 2019 NCAA tournament. Not only did the sophomore leave spectators in awe with an incredible triple-double performance in anchoring an 83-64 upset victory over the fifth-seeded Marquette, he also got the attention of a fellow former mid-major star: Golden State Warriors guard Stephen Curry. Morant burst onto the national scene Thursday with 17 points, 16 assists and 11 rebounds. He displayed supreme athleticism, impeccable decision-making and leadership in guiding the Racers to the largest win by a No. 12 seed in nearly two decades. Morant was the first player to secure a triple-double in the tournament since Draymond Green did it with Michigan State in 2011 and 2012. Only eight players have accomplished the feat in tournament history. The 19-year-old was already projected to be a top-five pick in June’s NBA Draft before the tournament, but because he played in the Ohio Valley Conference, his exposure was limited — until now. Curry, who led Golden State to a 112-89 win over the Indiana Pacers on Thursday night, is all too familiar with Morant’s trajectory. As a sophomore in 2008, the two-time NBA MVP spearheaded a run that pushed Davidson to the Elite Eight and became only the fourth player in history to score 30 or more points in his first four NCAA tournament games. He was the first player since 1994 to be named a regional Most Outstanding Player despite failing to reach the Final Four. Curry declared for the draft the next year and was drafted seventh overall by the Warriors. 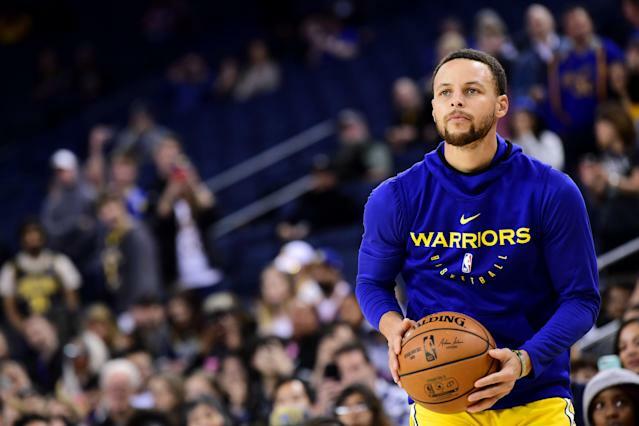 “To be honest, I feel like in this day and age, I don’t know what the difference is now versus when I played in a mid-major,” Curry told Yahoo Sports. “I don’t know what their schedule was like earlier in the season, and I don’t know if they played some heavy hitters, but it doesn't even matter. If you can play, you can play. Damian Lillard at Weber State was like that as well. Morant averaged 24.6 points, 10 assists and 5.5 rebounds this season, and it appears that playing against bigger schools in front of massive audiences isn’t going to subtract from those numbers. In short, the 6-foot-3 guard is the truth. As for the rest of Morant’s tournament journey, Curry shared some sage advice. Murray State will take on Florida State in the second round on Saturday.